Click on a place name for accommodation details or choose a town/village from the map for details of the place. 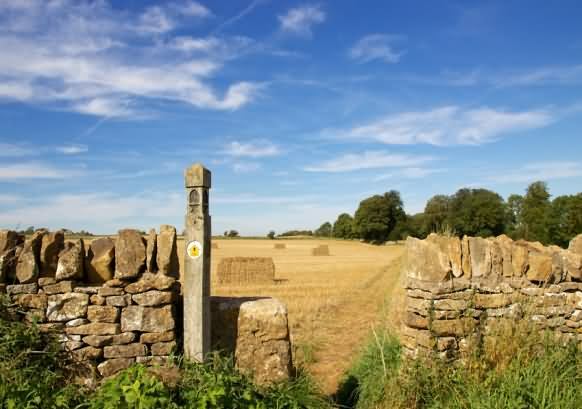 The Cotswold Way National Trail is a scenic, undulating route through quiet Cotswold countryside following the ridge through the Cotswolds Area of Outstanding Natural Beauty (AONB) via the villages of Broadway, Winchcombe, Dursley and Wotton-under-Edge. An attractive and popular trail that offers beautiful rural surroundings with facilities and services always near to hand. The 102 mile route starts at Chipping Campden and ends at Bath. The low limestone hills and agricultural valleys should cause no problems for anyone who is reasonably fit, but there are a few steep slopes, rising to the highest point at Cleeve Hill (highest in the whole of the Cotswolds) near Winchcombe (330m/1,083ft). Some paths can be muddy or hazardous in winter and boots are recommended. The Cotswold Way together with the Cross-Cotswold Pathway and Cotswold Link, forms part of the Cotswold Round, a a 331km/207-mile circuit of the Cotswolds. The Cotswold Way Trail walk is claimed to be the best marked trail in England. Update. In some locations the Cotswold Way is being diverted from its old route along new and improved paths. Where this occurs, the old path will remain open but will no longer be signed as the Cotswold Way. Rail. Bath, Stroud, Cheltenham, Moreton-in-Marsh and Evesham are on the Great Western main lines from London Paddington, and Statford-upon-Avon has a service to Birmingham. The Birmingham to Bristol line runs parallel to the Way with stations at Ashchurch, Cheltenham, Gloucester, Cam and Dursley. Coaches serve Bath, Cheltenham and Broadway, and pass within 5km/3 miles of Chipping Campden. Bus. There are bus services to numerous points along the Way including Cold Ashton, Tormarton, Hawkesbury Upton, Wotton-under-Edge, Dursley, King's Stanley, Painswick, Birdup, Leckhampton, Cleeve Hill, Winchcombe, Wood Stanway, Broadway and Chipping Campden (buses to Cheltenham, not Sundays). Few of these services run on Sundays. The Cotswold Way has been twinned with a scenic coastal walk in South Korea, to become one of the world’s first ‘friendship trails’. The initiative will see the 102-mile Cotswold Way Walk twinned to the Jeju Olle Trail, a new and beautiful long distance walking route around the coast of Jeju Island in South Korea. The link-up is a result of the World Trails conference on the island in 2010, attended by Cotswold Way representatives and hosted by representatives of the Jeju Olle Foundation. The new ‘twinned trails’ will be similar to the twin towns scheme, and it is hoped that the idea will spread across the world, promoting understanding and walking, whilst boosting tourism and local economies. To denote the association, a short circular walk following the Cotswold Way around Stinchcombe Hill near Dursley will be signed with special markers, introducing people to one of the most scenic parts of the Cotswolds Way walk, whilst raising awareness of walking in other countries. A section of Jeju Olle Walk will be marked with the familiar oak sign posts(as seen along the Cotswold Way), inviting visitors to the island to come walking in England. For national train journeys throughout the UK. A leading independent retailer of train tickets online selling tickets for all train companies on all national routes, with access to over 293 million fare and journey combinations. Trainline also sell tickets for popular shows in London & elsewhere.